The US has over 45 operating streetcar and light rail systems but none of them are anywhere near as large as Melbourne’s tram system. Melbourne has the largest extant urban streetcar network in the world with 249 kilometres of double track and 487 trams. If Melbourne’s tram network had been removed in the 1950s and 60s like similar systems in Sydney, Brisbane, Adelaide, Perth and many regional centres were, it would be astronomically expensive to build something like it today from scratch. The cost of rolling stock alone would be in the region of $3 Billion (1). Based on the actual $1.6 Billion it cost to build the newly opened 13 km Gold Coast G:link line, a network the size of Melbourne’s could have an all-up cost in the region of $30 Billion. Or if we extrapolate from the estimated $2.2 Billion it’s taking to build Sydney’s new 12 km CBD and South Eastern Light Rail system, the all-up cost could be in the region of $45 Billion. Of course these are ‘light rail’ rather than ‘tramway’ systems i.e. 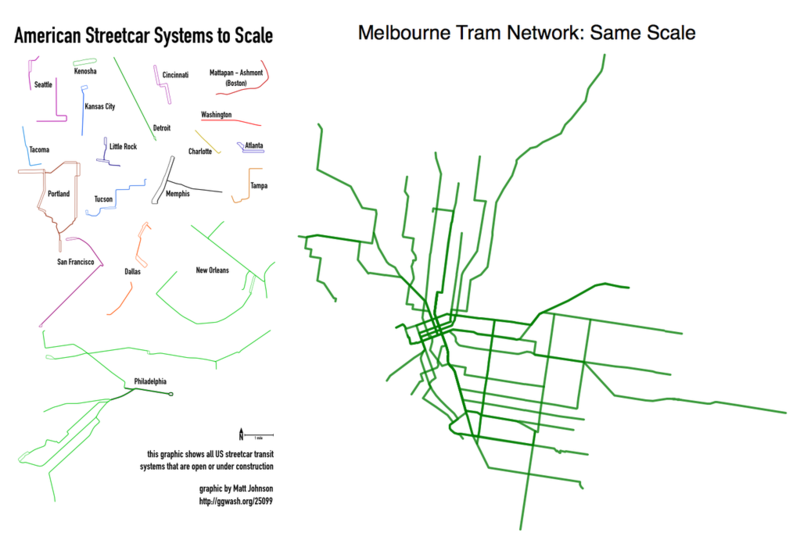 most of the network runs in its own right-of-way, whereas around 80% of Melbourne’s network shares road space with other vehicles. A brand new 250 km network would have the advantage though of offering an opportunity to obtain substantial economies of scale. However whether that opportunity were realised would depend on the sequence of construction; Melbourne’s network was built incrementally over the course of a century. There’s no guarantee, or even likelihood, that any new network of similar size would be constructed in accordance with the most efficient schedule. No matter what they might say, politicians don’t think or act like that. Melbourne trams do much better though in their key “market”: this is (a) trips to work (b) in the city centre made by (c) inner city and inner suburban workers. Around 15% of all CBD workers in Melbourne arrive by tram, as do 12% of those who work in Southbank and Docklands. This is where trams do best; more than half of all the work journeys made by tram are to these three geographically tiny locations. Moreover, up to 25%-30% of commuters living in inner suburbs like Brunswick, Northcote, Albert Park and Kew travel to work by tram. One is that only around 8% of the metropolitan area’s population lives within 5km of the GPO (the inner city) and around 25% with 10 km of the GPO (inner city and inner suburbs). Another is that while the CBD, Southbank and Docklands constitute by far the biggest and densest concentration of jobs in Melbourne, they still together only account for around 15% of all jobs in the metropolitan area. And finally and most importantly, the journey to work only accounts for about 15% of all trips. Workers who travel by tram to get to work tend to use other modes – especially cars – for their more numerous non-work trips. There’re two important messages here. One is that Melbourne is extraordinarily fortunate that it retained this asset when other cities removed theirs (Sydney’s network was actually larger than Melbourne’s). It was assembled incrementally over 100 years, almost all of it in eras when the politics of construction in built-up areas was easier than it is today. City policy-makers will have to think much harder about ways of managing the demand for travel in cities rather than accepting all demand should be catered to. They’ll also need to focus on how to extract much more value from the legacy infrastructure they’ve fortuitously inherited. Update: the source of the LHS panel of the exhibit is Matt Johnson; the author of the RHS panel is Rob Amos. Based on the current $300 million contract to provide 50 E class trams. One of the key reasons for the general escalation in infrastructure costs over time, especially in Anglophone countries, is the higher expectations of users and the public. And if the costs were reduced through cost-saving decisions like less segregation, then the benefits would likely be lower too. Estimates differ. McGeoch estimates trams had a 2% mode share of daily motorised trips in 2007/08. BITRE Yearbook 2013 estimates trams accounted for 1.4% of all passenger kilometres in Melbourne in 2010. A light rail system would significantly reduce the number of buses required (most patronage would come from buses, not cars). It would also reduce operating costs, but that’s not necessarily a given – this report says the operating costs of Portland’s much vaunted light rail are double those of the city’s buses. Although small relative to private travel, at a mode share of 4% of motorised trips, Melbourne’s trams are not that far behind trains, which have a mode share of circa 6%. There’s an interesting question here about how the benefits of trams match up against the costs, but I’m not going there at this time. The proposed 9 km Melbourne Metro rail tunnel, which the Andrews government has signalled it will have difficulty funding, has an estimated cost of $9-$11 Billion. The now abandoned 6 km East West Link motorway was to cost $6.8 Billion. Update: @Kestinen reckons the longest ever system in the world was the Belgian NMVB which he says had a staggering 1528 km of track in 1950. That easily outdoes the previous leader, Buenos Aires, which had over 800 km. Melbourne of course kept its trams when all those around were losing theirs, so it remains the longest existing network. Not clear if the Belgian example relates to a single centre or whether it’s a national figure.